I suppose we were both in the writing mood at about the same time. I mailed a letter to you at 5:50 yesterday. So glad you like your courses for this semester. I hope you can come up with some A’s and nothing lower than B’s. Your experience in the Martinsville church should teach you a lot. You haven’t been exposed to anything like that so I know it seems strange to you. Don’t try too hard to change them. I can’t remember where I read about the one letter of Paul being extant, but I suppose Dr. Hill has better information. I am listening [to] Figaro. It has become one of my favorites. I think I could listen to it all day. [page 2] I will send the kit and dictionary. I wondered if you had forgotten those items. Save the stamps on the card you received from S.A. I received a card from Councils of Churches acknowledging my last box of stamps. Since the first of this year they have delivered 890 tons of U.S. Gov’t surplus food to needy families and orphanages overseas. Also $5,938.90 to Church World Service. So keep those stamps for me to send in. Again Happy Birthday. 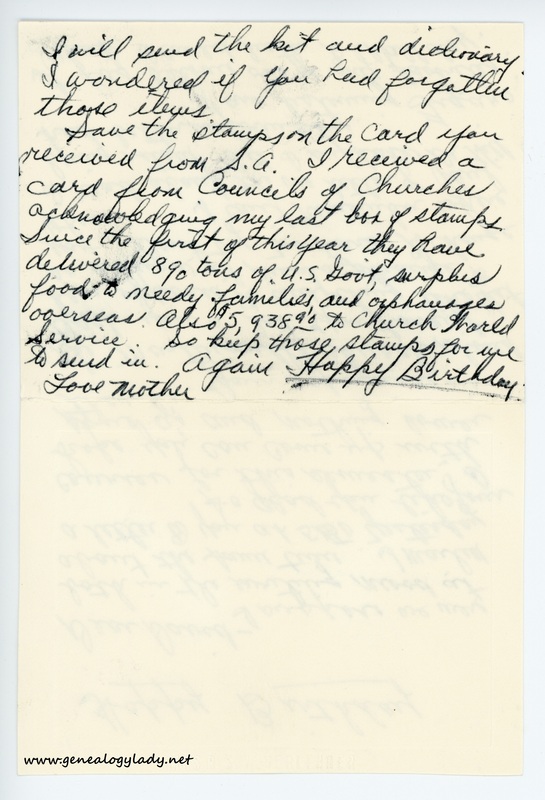 This entry was posted in Genealogy, Yegerlehner and tagged 1960s, David A. Yegerlehner, Dr. Hill, genealogy, Gladys R. (Foster) Yegerlehner, Indiana, Indiana University at Bloomington, Kentland, Wright Quadrangle on November 15, 2016 by Deborah Sweeney. 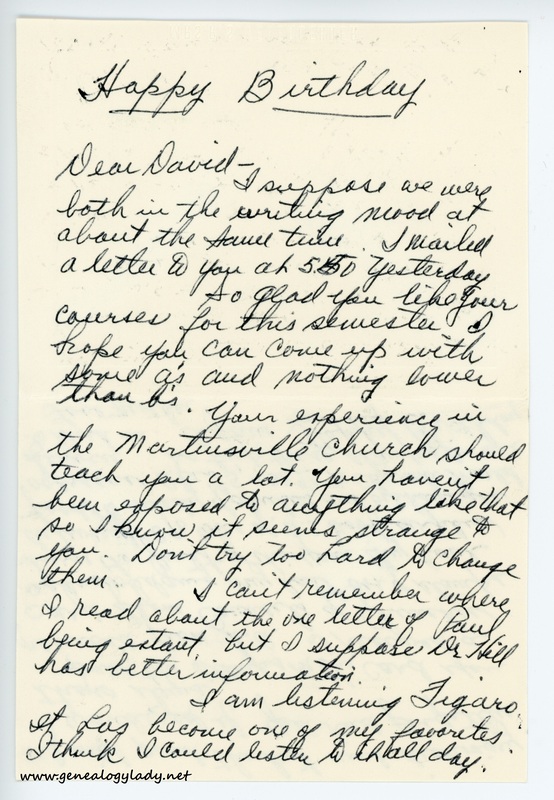 “Your experience in the Martinsville church should teach you a lot. You haven’t been exposed to anything like that so I know it seems strange to you. Don’t try too hard to change them.” Hmmmm, wish I could remember what this was about. I suspect they were very conservative, and mother was not on the fundamentalist end of the spectrum. “I can’t remember where I read about the one letter of Paul being extant, but I suppose Dr. Hill has better information.” Definitely wrong information: no letters of Paul have survived; there are no originals of ANY books of the Bible. I do remember saving stamps for her.